New Forest LEADER anticipates that funding could be fully committed by late Spring 2019. In this final phase of the programme, which has been running since 2015, the LEADER Grant budget is a small and steadily diminishing pot – so if you have an approved expression of interest and are currently preparing a full grant application, we strongly recommend that you do not delay in submitting it. The New Forest LEADER Programme is re-opening to new Expressions of Interest (the first stage in the application process) –initially until 28 Feb 2019 or until remaining funding is allocated, whichever is sooner. The EU’s New Forest LEADER grants can be used to fund investment in certain types of buildings, equipment and machinery to help small businesses grow and/or create jobs. However there is now very limited grant budget still available, so businesses are encouraged to apply as soon as possible. LEADER can grant fund up to 40% of the investment cost (for commercial projects) up to a maximum grant amount of £75,000. The minimum grant amount you can apply for is £5,000. Applications must be approved before the project can start. • Investment in businesses or not for profit organisations which provide services for rural communities i.e. rural retailers, transport etc. We are very pleased to report that HM Government has today confirmed that UK businesses will continue to benefit from European-funded grant programmes until the UK formally leaves the EU. This means that farmers, foresters and small rural businesses in the New Forest LEADER area still can take advantage of the LEADER grant scheme. However it is likely that the scheme will finish earlier than planned; we await confirmation of this date. The LEADER Programme is a source of capital investment funding to promote economic growth and job creation in rural areas. LEADER grants – ranging in value from £2,500 to £50,000 – can be used to fund up to 40% of investment in certain types machinery, equipment and buildings, with successful applicants being required to provide their own match funding for the balance of each project’s costs. LEADER funds originate from the EU and DEFRA, but individual grant applications are assessed and approved locally by independent panels (known as Local Action Groups) representing all facets of the rural community. 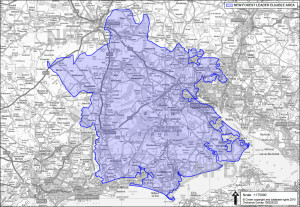 The New Forest LEADER area includes most of the rural New Forest, together with some adjoining areas in East Dorset (Burton), Southern Test Valley and South Wiltshire. Since its launch in January 2016, the New Forest LEADER Local Action Group, in partnership with New Forest District Council, has already awarded grants totalling £110,000, with a further £470,000 of outline applications pending. We are therefore encouraging potential applicants not to leave it too late to apply. Grant bids cannot be submitted or approved retrospectively for items that have already been purchased or work that has already commenced – and the application process takes approximately 6 months from start to finish – so potential applicants need to plan well ahead in order to submit their grant bids as early as possible in their project’s life-cycle. The LEADER grant budget is an ever-diminishing pot; so if you are running or starting-up a rural business and are looking to invest in certain types of equipment, machinery or buildings – don’t delay, visit our website at www.newforestleader.org.uk for information on what we can fund and how to apply. Some types of not-for-profit organisations and activities are also eligible to apply for grant support – again, further information is available on our website. New Forest LEADER will be part of New Forest District Council’s ‘Helping Local Business Grow’ stand at the New Forest Show on 26th, 27th & 28th July 2016. As well as information on the support available for anyone wishing to start or grow a business in the New Forest, there will be a ‘Business Drop in Zone’ where you can talk with business experts, or network with other businesses. Staff from the New Forest LEADER programme will also be on the stand to advise you on your project’s eligibility for a LEADER grant and to talk you through the application process. New Forest District Council’s ‘Helping Local Business Grow’ will be in Block 24, adjacent to the Hoburne Ring.